In the last days of shooting before the summer we had a meeting with artist Anish Kapoor. I first met the work of Anish in 1992 at the Documenta in Kassel. After standing in line for hours it was my turn to enter a place in which his work “Decent into Limbo” was placed. To describe what happened inside of me while standing alone in front of this black hole, which afterwards turned out to be deep blue, is like describing an absence…it is ineffable. It was there and than that I realised what Abel realised when he saw a white piece of art as a boy, there is a way to express this “not there” feeling, through art. So filming with Mick, Abel en Anish in his studio in London, amongst all kinds of works in process, was a treasure and a beautiful experience for all of us. Here you see our group picture taken by Venetia, the very patient organizer of our trip together with our own brilliant producer Esther van Lune. 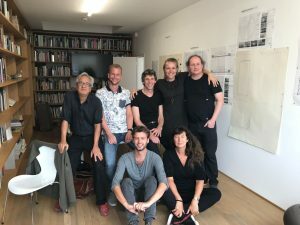 Sir Anish Kapoor, Mick van Jole, Fokke van Saane(sound), Esther van Lune, Jean Counet (camera), Abel Jansma, Maartje Nevejan.